Herald: Have you met the other TED? Have you met the other TED? “Have you met Ted?” That’s a phrase that has steeped in pop culture for the generation of today, stemming from the popular sitcom ‘How I Met Your Mother’. However, in the recent past, Goa has been acquainted with another popular TED (Technology, Entertainment, Design). It began as a one-off event in 1984, and today is a non-profit organisation devoted to ‘ideas worth spreading’. This is usually achieved in the form of short, powerful talks, delivered by leading thinkers and doers. Its offshoot, TEDx, was created in the spirit of TED's mission, and supports independent organisers who want to create a TED-like event in their own community. Grasping this opportunity, Goa College of Engineering, Farmagudi (GEC) has put together its version of the event, which will be held on August 2, 2017. 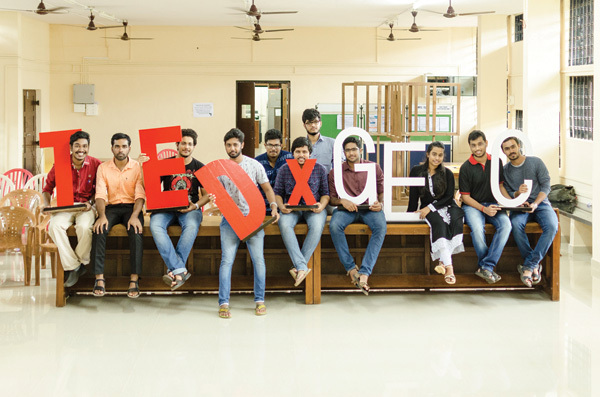 TEDxGEC began in 2016 with the institution’s first event being held on August 17, 2016. Shreegireesh Jalihal is the first licensee of the event, and is the TEDxGEC’s current organiser. He and his team have returned a year later, with an even more focused and ambitious event. The upcoming TEDx event is called ARTiculate and will be held on August 2. It's a ‘Salon’ event, where, instead of speakers just talking, it will have open discussions as well. Salons are still very new among the Indian TEDx community, and there are only a handful of active Salon events in the subcontinent at this juncture. These events are all about community building, where TEDx talks and ideas are used to bring together a local community, enhance the conversation and tailor-make ideas to the convenience of the student community. Being titled ARTiculate, the event has an evident art angle/theme to it. There are a total of three speakers for the 2017 edition of the event: Anish Sood, the winner of the 2014 ‘MyFav Best House DJ’ and ‘DJ of the Year’ awards, Aditya Jambhale, Goan director, screenplay writer and theatre artist, and Dr Subodh Kerkar, the founder of Museum of Goa and a household name in the Goan art sphere. “It's not just their work right now that will be covered. They're connected through their backgrounds as well. None of them are from an ‘arts background’, with all three having graduated from entirely different fields. Anish Sood graduated as a mechanical engineer, while Aditya has an Electronics and Telecommunications degree, and Dr Kerkar is from the medical background. All three of them transitioned from their respective fields in which they were working, to pursue their passion for more creative fields. This transition from one field to another, the similarities and contradictions in the areas, and the obstacles they faced will also be highlighted,” Shreegireesh shares, speaking about the event. Through the event, the TEDxGEC team’s goal is to highlight the fact that art and science are inseparable. They aim to point out that the overlapping of the two fields can only yield mindboggling results. Whether it's Anish Sood's upbeat electronic music that uses modern day equipment and sophisticated software, or Dr Kerkar's upcoming project which involves an app and VR gear that will give its user a chance to experience Gandhi in 3D, or Aditya's film which was applauded for its technical prowess at the recently held National Film Awards, there's no denying the fact that the fields create wonders when they intersect. is one of the most prolific artistes to break through on to the Indian dance music scene. His hit single, 'Superfly', peaked at #3 on the iTunes India chart, and his weekly podcast 'Sunburn on Air' is wildly popular. He’s also performed alongside some of the biggest names in dance music, including David Guetta, Dmitri Vegas & Like Mike, Steve Aoki, Afrojack and Axwell, to name a few. is the Founder/President of ‘Shree Mahalasa Productions’. After graduating in Electronic Engineering (2013/GEC) and working for two years in the IT sector, Aditya quit his job to pursue a Diploma in Filmmaking, with specialisation in Direction, from Mumbai. He has been working in Theatre/Drama (Goa/Mumbai/Pune) for the last six years as writer, director and actor. He entered film direction with a Marathi short film ‘Aaba Aiktaay Naa?’ (Aaba Are You Listening? ), which won the National Award for Best Direction at the 64th National Film Awards 2017. ‘Aaba Aiktaay Naa?’ became the first ever Marathi film to have been mixed in Dolby Atmos by award winning 'Baahubali' sound mixer, Justin Jose. is a visual artist who left his medical profession to pursue his passion for visual arts, and has created remarkable works in the field across the world. He's deeply influenced by the ocean, and uses it to create art that talks about history and politics. Among a plethora of works, his more recent endeavour, ‘Carpet of Joy’, created waves across the state – a creation made from 1,50,000 discarded plastic bottles.